Whether you are planning your big fat dream wedding or just nipping to the registry office next week, know that flowers play a big part in your wedding decor. Choosing wedding flowers isn’t something you do every day so we are happy to hold your hand and take you down the flower path. Flowers can make such an impact on your wedding decor. It is wise to collect your thoughts and wishes. And don’t worry, we are happy to help you with any questions you have. Our service is entirely dedicated to what YOU want on your wedding day, so you are leading the way. Here at Rose&Mary we are ready with advise on seasonality, styling, colour palette and working within your set budget. Before you are ready to book your wedding flowers please come along to a free consultation where we will talk you through the options so we can make your big day not just how you imagined it, but even more amazing! Consultations are no hassle, no obligation, free of charge and we can either come and see you or you come and see us. No two weddings are ever the same and its really important to us that we can provide you with the flowers for your wedding that you really want or need. In order for us to prepare a bespoke quote for you we need as much information from you as possible. We have an enquiry form that you can request, fill in and return to us along with your Pinterest page or any images you might have. We can send you a quote based on the information you have send us or we can sit down and have a coffee and discuss the many option available to you. To book a consultation please get in touch. How long is a piece of string? The cost of wedding flowers hugely depends on what your wishes are. It’s hard to know as it’s probably the only time in your life that you would need our services. If you would like to add or change items in these packages or request a bespoke price estimate please get in touch. 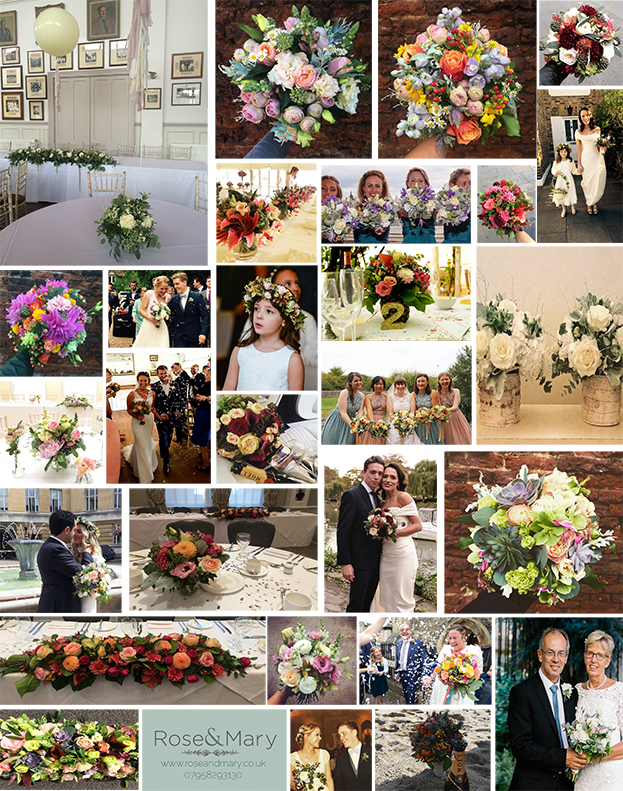 There are a lot of impressive pictures on Pinterest and Instagram, showing you beautiful wedding flowers. We can help you how to roughly calculate what those inspirational images on Pinterest would cost and how to translate that to flowers that will fit within your budget. We have a few favourite wedding venues that we like to work with. It’s always beneficial to know the layout of a venue and to know what flowers work well in what space. We always welcome a chance to work somewhere new and are always happy to organise a site visit but if you would like to know where we have flowered weddings before here is a list of wedding venues. Want Peonies in Autumn and Tulips in Summer? Then these flowers will be very hard to come by and also very expensive. If you are going to spend a substantial amount of money on flowers, our advise is to keep it seasonal. Every season has it’s own distinct flowers and colour schemes. Rose & Mary is a Flower Studio, based in Richmond, West London. We specialise in seasonal wedding flowers, event and funeral flowers, seasonal decor and a bouquet deliveries. We pride ourselves in happy clients. Please check our testimonials and read what other clients have to say.